Some of the bravest and most memorable moments in rock history have occurred when established stars have tried to shed their typecasting by the public and done something drastically different in order to prove a point, or just to follow their musical whims. Bob Dylan shocked everyone in the mid 60s by plugging in an electric guitar; Led Zeppelin followed up their huge second album, a hard rock classic containing "Whole Lotta Love" among others, with the mostly acoustic third album; Bruce Springsteen took some time off from the E. Street Band in the early 80s to record and tour with the acoustic Nebraska album before returning to do the "Born In The USA" LP. In each case, the risk was considerable, but they pushed on anyway to be true to themselves. 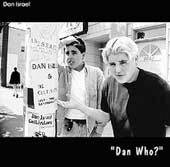 On a much smaller scale, independent artist, Dan Israel, has done the same thing with his new Dan Who? album. Dan is the leader of a Minnesota-based roots rock band called The Cultivators, who follow in the best tradition of bands like The Jayhawks, Tom Petty & The Heartbreakers, and The Wallflowers. The Cultivators have released two records (see my review of their latest, 1999's Mama's Kitchen), and have achieved modest success with airplay internationally and on college radio stations. Dan could have stayed comfortably in the confines of the band and gone straight into working on their next record, but instead he decided to take a detour and come out with this collection, 12 songs featuring just him and his acoustic guitar. These tracks were just too personal. They were not "band songs" - they were songs about the struggle of a no-name artist: lack of recognition, trying to keep up with musical trends, loss of old friends, the trials of growing up and realizing just how important your family is in your life. On the surface, this collection may seem too idiosyncratic for some, but in a way, it's a reflection of everyone's struggle through life. This record feels like you're in Dan Israel's living room and you've asked him to play his new songs for you. Not far removed from the level of a demo recording, There are overdubs for guitar leads - but nothing too elaborate. The listener feels included in a small closed circle of friends and one almost hesitates to tell the rest of the world, but Dan Israel should be heard. He easily has the talent to be a big star. So much of the music business has to do with luck and the right time and place. Dan Israel is better off with full-band electric records like Mama's KItchen. An all-acoustic album like this probably won't be a breakout record. He knows that too, but he still had the courage to make it, and for that he deserves a lot of respect. One thing I like about Dan so much is that he doesn't take himself too seriously. He named his solo album Dan Who?. He included an interview with himself in his media packet. However, what he does take very seriously is his music and being true to himself and his upbringing. He's real. No influence from money-minded A & R men at big record companies. People like him are the true mirrors of society. One MInneapolis reviewer wrote that someone should buy out a billboard or rent a blimp to spread the word for him. I agree. He needs a big break. I hope he gets it soon. May he get his recognition in his lifetime. He deserves it.